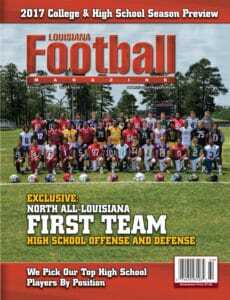 This week starts arguably the best time of the year for Louisiana High School Football as even though the regular season has ended, a new season has arrived and that is the playoffs. The playoffs are always unique in the sense that is unlike the regular season as you lose, there is another week to play. In the playoffs, there is no tomorrow because if you lose, you go home. Through all the classifications and all of the teams in the playoffs, there is one goal and mind and that is to be one of nine teams in the end holding a state championship trophy in the Mercedes-Benz Superdome with the Queen smash hit “We Are the Champions” playing in the background. 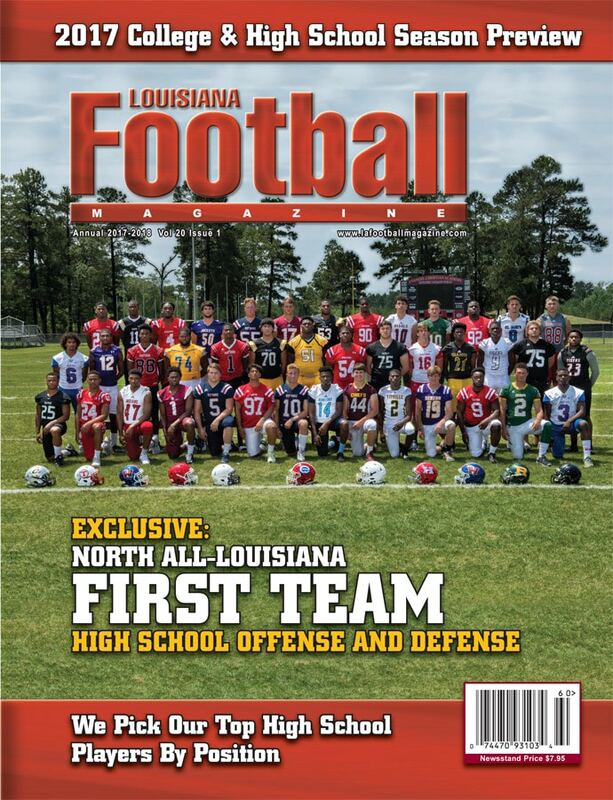 For Louisiana football fans, this is the most wonderful time of the year. This year, we got you covered as for the next couple of weeks, we will go through all of the matchups from 1A all the way to 5A each and every week leading up to the All-State Sugar Bowl/LHSAA Prep Classic from December 7th-9th. We weren’t able to get in our 5A playoff preview before the games start, but we will give you a quick recap of the games and what actually went on before we give out our second round previews for tomorrow. #1 West Monroe Rebels (11-0) defeats #32 Central Wildcats (4-7) 51-15. Game Recap: The Central Wildcats are very familiar with being the underdog to the mighty West Monroe Rebels and defeating them. In 2013, West Monroe hosted a first round home playoff game against the Central Wildcats and the Wildcats came up with the upset victory. It also happened again this year, but this time in baseball when the Central Wildcats upsetted the West Monroe baseball team in the Class 5A state championship after they were ranked as the #1 baseball team in the country. However, this time, the West Monroe Rebels, led by Jerry Arledge, were not going to let another upset happen. West Monroe’s star QB and Alabama commit Slade Bolden made sure early on that he was going to be a force to be reckoned with as he scored on the first offensive play from scrimmage within the first couple of minutes in the game to give the Rebels a 7-0 lead. On the ensuing kickoff return, Central’s Quint Guerin returned the kickoff 97 yards to tie the game at 7, but unfortunately for the Wildcats, that was as close as it was going to get as the Rebels began to dominate the game with 30 unanswered points going into the second half. Bolden was simply on a roll in this game as he scored his 100th touchdown in his legendary Rebel career. He finished the game with 276 total yards of offense and a couple of touchdowns. Meanwhile, LB John Bailey Gullatt and the Rebel defense only gave up 15 points. For Sid Edwards and the Central Wildcats, they end their season with a 4-7 overall record. Meanwhile, the West Monroe Rebels move past the first round as they try to redeem their state championship game loss a season ago. Next up, the Rebels will face the #17 seed Dutchtown Griffins. #2 Covington Lions (11-0) defeats #31 Thibodaux Tigers (4-7) 35-21. 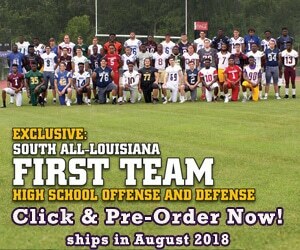 Game Recap: The Covington Lions are one of the most well balanced offensive attacks in the entire state once QB Josh Alfaro (Arkansas Baptist commit) and RB Devin Brumfield (Texas Tech commit) get to be on the same page, and they were on the same page against a Thibodaux football team that is way better than its record. Well, that happened for the Lions as Alfaro had a really good game through the air from the start as the first possession, he threw a 65 yard touchdown to Elgin Bell to give the Lions a early 7-0 lead. When Covington got the ball back, they moved the ball down the field once again this time resulting in a two yard touchdown run by Brumfield. The Tigers drove down the field, but Brandon Cone‘s field goal was no good giving the Lions a chance to pad up their lead. Alfaro threw a 38 yard completion to Bell and it seemed that the clock ran out, but the referees decided to play one more play before the half as they put two seconds on the clock. That decision played in the Lions’ favor as Alfaro hit a Hail Mary pass to Bell to give the Lions a 21-0 lead as well as the momentum. Alfaro would throw for two more touchdowns and the Lions actually scored three touchdowns from QB Demarcus Mitchell in the second half to make the score closer, but the game was all but decided due to the great QB-RB duo of Josh Alfaro and Devin Brumfield. Alfaro ended the game with 278 passing yards and four touchdowns while only throwing two incompletions the entire game while Brumfield ran for 98 yards on 18 carries and a touchdown. The Texas Tech commit also sat through the fourth quarter to get ready for the next game. For Chris Dugas and the Thibodaux Tigers, it was a violent effort in the second half, but the team ends their season with a 4-7 record. For Greg Salter and the Covington Lions, they will advance to the next round to play #15 Ouachita Parish. #3 Acadiana Rams (10-1) defeats #30 Comeaux Spartans (4-7) 52-20. Game Recap: The Acadiana Rams face a familiar foe in the first round of the playoffs against their district rivals the Comeaux Spartans. This is a rematch of a 49-13 win for Acadiana earlier in the season. Unfortunately for the Spartans, it was pretty much more of the same. The Acadiana defense came to play early as the Spartans fumbled on their first drive with Elisha Sion forcing the fumble. The turnover allowed the Acadiana offense to have great field position to work with and as a result, the Rams scored on a Ziggy Francis touchdown run to put the team up top at 7-0. Then, the Rams scored again after forcing a three and out and once again, Francis scored a touchdown this time from 38 yards to extend the Acadiana lead at 14-0. After one quarter, the Rams were already up at 17-0. The defense did not allow the Spartans to get in the game as the unit forced six punts and two turnovers. While Francis was getting it done running the football in the first half with over 100 yards and two touchdowns. In the second half, the Rams showed how deep the running position is as the backup running back Dillon Monnette ran for 175 yards and two touchdowns to help seal the game in the second half. Overall, the veer worked to perfection with over 400 yards rushing. It was another dominating performance for the Rams as the team won an incredible 24 straight playoff games on their home field. 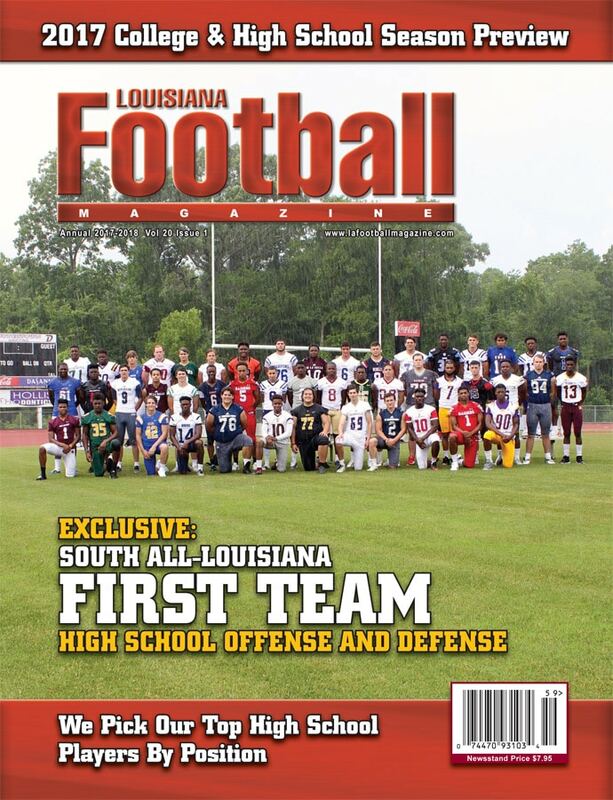 The Comeaux Spartans, led by Doug Dotson, will finish their season with a 4-7 overall record. The Acadiana Rams, led by Ted Davidson, will advance to the next round to take on the defending 5A state champion Landry-Walker Chargin’ Buccaneers. #4 Zachary Broncos (9-2) defeats #29 Mandeville Skippers (4-7) 38-0. Game Recap: The Zachary Broncos are looking to having another playoff run as this Broncos squad, led by David Brewerton, have made at least to the Class 5A semis-finals over the last three years including a state championship back in 2015. The run starts against the Mandeville Skippers, who have had a tough year after the surprising resignation from legendary Mandeville head coach Guy LeCompte. For the Skippers, the game was pretty much over from the start as Zachary’s DE Keshawn Sullivan forced a Darren Steele fumble on the very first play of the game to help set the tone for the entire game. The Broncos’ dynamic sophomore quarterback Keilon Brown was the main catalyst on the offensive side of the football as he had 280 total yards of offense and four touchdowns. Meanwhile, the Zachary defense kept Steele in check the entire game as the offense could only muster 100 total yards at the half and another 100 yards in the second half. The game was well in hand by the third quarter as the Broncos held a 24-0 lead entering the half. The Broncos would score two touchdowns in the second half while the defense had a shutout with a final score at 38-0. For the Mandeville Skippers, led by first year head coach Josh Buelle, finish the season at 4-7 while the Zachary Broncos will move on to the second round to face the #13 seed John Ehret Patriots, which was the team that Zachary defeated in the 2015 Class 5A state championship. #5 St. Amant Gators (9-1) defeats #28 Northshore Panthers (5-6) 41-38 in double overtime. Game Recap: The #5 vs. #28 matchup has been a very difficult one as Belle Chasse was able to pull the upset against the higher seed Plaquemine Green Devils. This was almost another upset as the St. Amant Gators, led by David Oliver, barely survived the Northshore Panthers led by Michael Bourg in double overtime. The game did not start as if it was going to be a thrilling two overtime game as the St. Amant Gators took command early on leading the half at 21-0 thanks to their workhorse running back Cade Nelson, who ran for two touchdowns in the first half, and their stingy defense. However, the Northshore Panthers woke up in the second half including the passing game as Northshore QB Walter Harris threw two touchdowns one to Cole Cavallo for 76 yards and the other to Jeremiah McDonald for 63 yards all in only two minutes to shrink the gap to only seven at 21-14. Then, with just under four minutes left to go in the game, the Panthers tied the football game up at 21 with a four yard touchdown pass from Harris to Cavallo. St. Amant took the lead again with another touchdown run from Nelson to give the Gators the lead with a couple of minutes left to go in the fourth quarter, but it was still much time for the Panthers to drive down the field and tie it again. Well, that is exactly what they did. The Panthers drove the ball withing three minutes and scored to tie the game with only six seconds left in regulation as Harris ran for a nine yard touchdown to tie the game at 28-28. In an entertaining four quarters, there was still a little more left to be played. In the first overtime, it was still the Cade Nelson and Walter Harris show for both teams as Nelson ran for his fourth touchdown and Harris threw his fourth touchdown to send it to another overtime. This time, the Gators defense held the Panthers to a field goal to make it 38-35 in the second overtime. All the Gators had to do was score a touchdown to win the game. In order to get to the endzone, they gave the ball to a guy that has got them there all season long and that is Cade Nelson. On second and goal, Nelson was able to get in the endzone for the game winning touchdown and to continue their postseason run. It was a great effort by the Panthers who gave it everything they had, but in the end, the Gators were able to make the plays when they were needed most. Nelson carried the Gator offense with 32 carries for 278 yards and five touchdowns. He will have to do more of the same this week as the Gators will face #12 seed Airline. #6 East Ascension Spartans (8-2) defeats #27 East Jefferson Warriors (5-6) 35-14. Game Recap: For the East Ascension Spartans, under Darnell Lee, they are coming off a game in which the team not only fell short of the district championship, but fell short against their biggest rivals in St. Amant. If the Spartans overlook a team like East Jefferson, it could be an upset coming in and it did look like it early. The Spartans fumbled on their opening drive and East Jefferson’s Kendo Williams picked up the loose ball to recover it inside the Spartan’s five yard line. That helped put the Warriors in the lead early at 7-0 after a Desmond Lastie touchdown run. Then, the Spartans started to wake up as their star offensive playmaker Jimel London ripped off a 65 yard touchdown to tie the game at seven. That 65 yard touchdown started a trend for the Spartans as they scored 28 unanswered points ever since. East Ascension’s dominance after the 7-7 tie had to deal with two major keys. The first thing is that offensively, the Spartans had big plays. Throughout the game, East Ascension only ran 35 plays, but there were a lot of big plays including 11 yard touchdowns by London and Thomas Levy as well as a 57 yard run by Nick Massey, who made up for his fumble earlier in the game. The second thing was that the Spartans were able to shut down the running game due to their big defensive line and put East Jefferson in third and long situations, which are not their strong suit. The Spartans had a great plan and they played a great game to defeat a good East Jefferson football team 35-14 to advance to the next round where they will take on the #22 Live Oak Eagles. #7 Ruston Bearcats (8-2) defeats #26 East St. John Wildcats (5-6) 35-25. Game Recap: Although the Ruston Bearcats are the #7 seed, they are not overlooking a very athletic East St. John Football team just simply because the Bearcats lost in an upset in last year’s first round matchup against East Ascension. The game was very close early on in the football game as the score was tied at seven in the first quarter. Then, Ruston decided to take control of the football game as they took the lead on a Eric Outley touchdown pass to Donald Johnson to make it 14-7. The Bearcats scored another touchdown this time with their other quarterback CJ Willis, who threw a 34 yard touchdown to one of the best tight ends in the state regardless of class in Ray Parker to extend the lead to 14 at 21-7. That would be the halftime score. Our defending 5A Defensive Player of the Year Tahj Samuel made an impact on the offensive side carrying East St. John defenders for tough yards including an one yard touchdown run to extend the Bearcat lead to three touchdowns. The Wildcats answered by giving their best playmaker Javon Antonio the football with a touchdown reception from their quarterback Dasmain Crosby to make it 28-13. Antonio would have a great final game in a Wildcat uniform as the senior had six catches for 165 yards and two touchdowns. Fortunately for the Bearcats, they got another score from Willis to make it a three touchdown game once again. The Wildcats made a fierce comeback scoring two more touchdowns to make it a ten point game thanks to Crosby, but that was as close as it was going to get. The Ruston Bearcats, under first year head coach Jerrod Baugh, move on to the next round to play the Hahnville Tigers, which should be one of the best quarterfinal matchups in 5A. For the East St. John Wildcats, under Alden Foster, end their season with a 5-6 overall record. #8 Destrehan Wildcats (9-2) defeats #25 Alexandria Trojans (4-7) 33-14. Game Recap: The Destrehan Wildcats, under Stephen Robicheaux, were ready for this game against Thomas Bachman and the Alexandria Trojans from the very start as the Wildcats were able to control early on as QB Harold Blood Jr. was able to connect three times to sophomore WR Joseph Washington on that drive setting up a one yard touchdown run from Kyle Edwards to give the Wildcats an early 7-0 lead. After a three and out forced by the Destrehan defense, the offense was able to score this time in the passing game as Blood hit Edwards for a 23 yard touchdown to give a 14-0 advantage to the Wildcats early on. The Wildcats jumped up to a 17-0 lead when the Trojans finally got in the endzone. QB Ben Hesni threw a 13 yard touchdown pass to their best playmaker in senior WR Jorien Vallien to make it a 17-7 game. Then, the Wildcats were able to get back on track after a nice kick return by Dontrell Smith helped give the Wildcats excellent field position, and they took advantage of the great field position when Blood threw his second touchdown hitting TE Carson Ridder with 24 seconds left to go in the first half. The score at halftime would be 24-7. After a scoreless third quarter, the scoring came more frequently in the fourth quarter when Blood threw his third touchdown pass to a leaping Quinton Torbor who caught a 43 yard touchdown over an Alexandria defensive back to give the team’s biggest lead at 24. The Wildcats also got a safety later in the quarter to make it 33-7 before the Trojans added on to the scoreboard before the end of the game. The Destrehan Wildcats move on to the next round to face the #9 seed Barbe Buccaneers. Game Recap: The Barbe Buccaneers took a lot of momentum early in the football game as it looked like Parkway was going to take an early 7-0 lead after a long run from their quarterback Amani Larry, but after that run, the opportunistic Jarden James intercepted Larry’s pass 85 yards for a touchdown to take a 7-0 early lead. This set the tone for the Buccaneers early on as the offense kept on scoring touchdowns with their running game. Jaivan Samuel had two touchdown runs and Dana Fontenot ran for a touchdown as well. Luke Richard did get some going in the passing game throwing a touchdown pass to Aiden Smith. All those scores happened in the first half to put the Buccaneers up at 24-0 in the first half. The Bucs did much more of the same in the second half as Samuel had a long 69 yard touchdown run and Richard threw another touchdown to Devon Pauley for 21 yards. In the end, it was all Barbe as they roll against the Parkway Panthers 52-6. For the Parkway Panthers, it has been a tough season as their two big time recruits QB Justin Rogers (TCU commit) and WR Terrace Marshall Jr. were lost at the beginning of the season, but first year head coach Neil May did a great job of rallying these guys to post a solid 5-6 season without the team’s best players. For the Barbe Buccaneers, under the leadership of Mike Cutrea, this will make it eleven straight years in which the team won at least the first round of the playoffs. 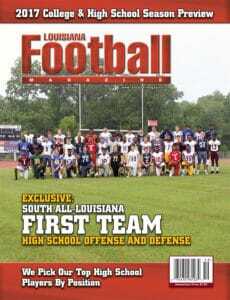 They will have a great matchup between the #8 seed Destrehan Wildcats. #10 Hahnville Tigers (9-2) defeats #23 Denham Springs Yellow Jackets (6-5) 42-21. Game Recap: Many Louisiana high school fans got glued to their T.V.s last Friday on Yurview to see the Hahnville Tigers take on the Denham Springs Yellow Jackets. This was a great matchup not only because it was between two great teams, but it also features two of the most explosive playmakers in the state in Denham Springs’ Tyre Golmond and Hahnville’s Anthony “Pooka” Williams. It did not disappoint for that matter as it was the Anthony Williams show. Anthony Williams broke the game open with some great runs in the second half as he had over 300 yards and an incredible five touchdowns. The Denham Springs Yellow Jackets had a good offensive performance from some of their other players, but the Hahnville defense did a great job of containing Golmond who only had 80 rushing yards in the game. It was a back and forth battle, but Williams was just too much for the Denham Springs defense to handle as the Hahnville Tigers advance to the next round with a 42-21 victory over the Denham Springs Yellow Jackets, which end their season at 6-5 under their first year head coach Bill Conides. There will be a lot of great things to come for Denham Springs, but it is Nick Saltaformaggio and the Hahnville Tigers that will move on to play against #7 seed Ruston Bearcats, which should be a tremendous matchup. #22 Live Oak Eagles (6-5) defeats #11 Sulphur Golden Tors (7-3) 23-10. Game Recap: In one of the biggest upsets in the Class 5A bracket this week, the Live Oak Eagles, under Brett Beard, were able to get the victory over the Sulphur Golden Tors led by Jeff Wainwright. The Live Oak Eagles were ready to play from the start of the game as Live Oak’s Ray’shion Brumfield intercepted a pass and then on the Eagles’ first offensive play, fullback Kee Hawkins started his great night by running for 30 yard touchdown. This was the first of three rushing touchdowns by Hawkins who also ran for almost 200 yards leading a running game that just exhausted the Sulphur defensive front with over 349 yards on the ground while the Eagles defense only held an explosive Sulphur offense to only 210 yards of total offense. The Eagles built a 23-0 lead at the half and did not even needed to score in the second half as the final score was 23-10. The Sulphur Golden Tors’ postseason run ends early after a great regular season with a 7-3 overall record. For the Live Oak Eagles, they will face the East Ascension Spartans hoping to knock off another high seed. #12 Airline Vikings (8-3) defeats #21 Chalmette Owls (7-4) 35-7. Game Recap: The Airline Vikings pretty much handled the Chalmette Eagles from kickoff as Airline’s star receiver Coby McGee really got going for the Vikings’ offense. McGee finished the game with 79 rushing yards and 68 receiving yards, but the senior receiver scored two touchdowns on his first two touches to help the Vikings maintain a 14-0 lead. While McGee was making the explosive plays, running back JoJo Davis pounded his way to over 80 rushing yards and two touchdowns. The Airline defense completely shut down the explosive Owls passing attack as QB Jason Roper was sacked four times and only 55 passing yards. Defensively, the Vikings gave up only 144 yards of total offense, forced four fumbles, and actually scored a touchdown as well. It was a dominating win for Bo Meeks and the Vikings as the final score was 35-7. The Vikings will move on to play the St. Amant Gators in the next round while Jason Tucker and the Chalmette Owls finish their season with an overall 7-4 record. #13 John Ehret Patriots (8-3) defeats #20 Haughton Buccaneers (7-4) 46-13. Game Recap: The John Ehret Patriots got on a roll early on against the Haughton Buccaneers. The John Ehret defense picked off Haughton QB CJ McWilliams on the first drive of the football game. This interception gave the Patriots good field position and the offense took advantage of it as Travis Mumphrey threw a 28 yard touchdown pass to star WR and Colorado State commit Jammal Houston to give the Patriots an early 7-0 lead. The scoring continued for the Patriots as Terrell Brown ran for a 26 yard touchdown run to make it a 13-0 lead. Then, Mumphrey threw a 24 yard touchdown to Zaven Fountain to extend the lead at 20-0. The Buccaneers finally got on the scoreboard with a Lavonta Gipson touchdown run to shrink the lead at 13, but the Patriots offense was just too much for the Buccaneers as they were able to score a late touchdown with just over 30 seconds left to go into the half to make it 26-7 at halftime. The Patriots pulled away from the Buccaneers in the second half thanks to the help of their offensive stars Travis Mumphrey, Jammal Houston, and Terrell Brown, who all had touchdowns in the second half. In the end, the John Ehret Patriots, led by Del-Lee Collins, were able to defeat the Haughton Buccaneers led by Jason Brotherton 46-13. In the next round, the John Ehret Patriots will face the Zachary Broncos, which would be a rematch of the 2015 Class 5A state championship game. #14 Landry Walker Chargin’ Buccaneers (8-3) defeats #19 Walker Wildcats (6-5) 14-7. Game Recap: The Landry Walker Chargin’ Buccaneers begin their Class 5A state championship game title defense against the Walker Wildcats and that run almost ended earlier than expected for the defending state champions. It was a very sloppy game for both sides, but especially for Landry Walker, which had five turnovers and over 150 yards in penalties. The first score of the game occurred with four minutes left to go in the half as the Wildcats finally took advantage of the Landry Walker mistakes with a Byron Lockhart one yard touchdown run to give Walker an early 7-0 lead. After the touchdown, Landry Walker’s RB Chad Alexander fumbled the football giving Walker the football again. It sure looked like that Walker was going to seize control of the game, but the Landry Walker defense stopped the Walker offense including an incompletion on a third and long which stopped the clock. This gave Landry Walker a window of opportunity and the special teams capitalized with an 82 yard punt return from Michael Rhea which set the offense up at the two yard line with only 12 seconds left to play in the half. Landry Walker QB and Kansas commit Corione Harris sneaked it in for the touchdown, but the Wildcats still had a one point lead going into the half after the missed extra point. Harris had a rough game turning the football three times and was even benched for backup Ja’Quan Dorsey. Dorsey did a great job of leading the Bucs down the field, but Harris came back for one play and took advantage of it using his legs to score on a 13 yard touchdown to give Landry Walker its first lead of the football game at 12-7. Landry Walker Head Coach Emmanuel Powell decided to go for the two point conversion to make it 14-7 and they got it as Dorsey completed the play to star WR and Kansas commit Devonta Jason. The Wildcats had a chance to tie the game late in the game as they were driving inside the 15 yard line, but on a fourth down conversion, the Buccaneers defense made a stand as LB Tyrik Baker intercepted Walker QB Christian Ard‘s pass to seal the game and escape with a 14-7 win. It was an off night for the Landry Walker offense, but luckily, the defense had a fantastic game only giving up 114 total yard of offense. For first year head coach Lester Richard, it was a strong first season as the Wildcats finish with a 6-5 overall record. For Landry Walker, the team will face #3 seed Acadiana next week. #15 Ouachita Parish Lions (7-4) defeats #18 Terrebonne Tigers (7-4) 35-17. Game Recap: The Ouachita Parish Lions were able to pretty much end this game by halftime against the Terrebonne Tigers. The onslaught started early as the Lions scored on their first offensive play with junior running back Dylan Roberts ran for a 49 yard touchdown to give the Lions an early 7-0 lead. Besides that touchdown run, it was a quiet first quarter, but the action started again when Ouachita’s special teams unit blocked a punt which was picked up by Ouachita Parish’s Jaquez Jackson for a touchdown. With the two point conversion, this gave the Lions a 15-0 lead. The Lions added two more touchdowns by Roberts and QB Jabari Johnson to put the Lions at the half 29-0. After a Terrebonne field goal that made the game 29-3, Jabari Johnson responded again with a 44 yard touchdown run to pretty much seal the game at 35-3. The Tigers were able to score some touchdowns late, but it was not nearly enough with Jeff Fitzgerald’s Lions defeating Gary Hill’s Tigers 35-17. The Ouachita Parish Lions will face the Covington Lions in a very intriguing second round playoff matchup. #17 Dutchtown Griffins (7-4) defeats #16 Slidell Tigers (7-4) 28-24. Game Recap: It seemed that the Slidell Tigers were going to run away from the Dutchtown Griffins, but in the end, it turned out to be a Slidell loss in one of the best games over the first weekend of the Louisiana high school football playoffs. The first half was dominated by the Tigers as they took a 24-7 lead at the half, but 21 unanswered points in the second half allowed Guy Mistretta and the Dutchtown Griffins to make the comeback. Big plays by Van’Shon Grayson including a 30 yard touchdown run and an 80 yard touchdown run made it a game as those plays shrinked the Slidell lead to only three points. After great defensive stands from both teams, the Dutchtown Griffins took the late lead to make it 28-24 after the touchdown run by Drelon Monroe. The Griffins were able to hold on to the lead and complete the comeback against Larry Favre and the Slidell Tigers with that score. The Griffins will face the #1 seed West Monroe Rebels in the next round of the playoffs. Previous: LAFM TV 12th Season! Episode 9!